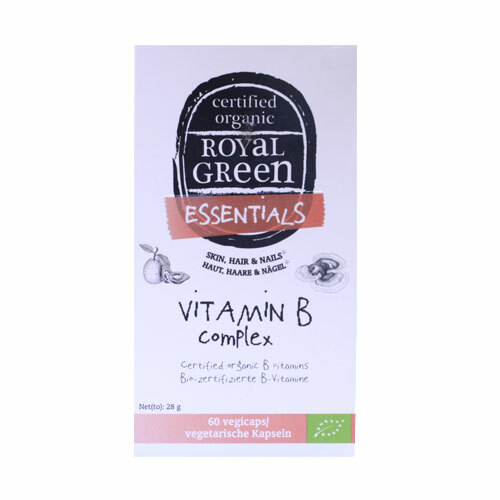 Royal Green delivers 100% certified organic B vitamins together with a powerful combination of Lavender, Rhodiola, Reishi, Turmeric, Ginger & Black pepper. Folic acid and Rhodiola contribute to the resistance against temporary stress. Vitamins B2, B5 and Folic acid contribute to the reduction of fatigue. Vitamin B6, Turmeric and Ginger support our immune system. Vitamins B1, B3, B6 and Folic acid support memory, concentration and our state of mind. Vitamin B mix (from guava (Psidium guajava), holy basil (Ocimum tenuiflorum) and citrus lemon (Citrus limon), capsule: HPMC, lavender extract (Lavandula officinalis), rhodiola extract (Rhodiola rosea), reishi (Ganoderma lucidum), ginger (Zingiber officinale), turmeric (Curcuma longa), anti-caking agent: magnesium carbonate, black mustard extract (Brassica nigra), bamboo extract (Bambusa arundinacea), sunflower oil (Helianthus annuus), black pepper (Piper nigrum). Below are reviews of Royal Green Vitamin B Complex - 60 Capsules by bodykind customers. If you have tried this product we'd love to hear what you think so please leave a review. 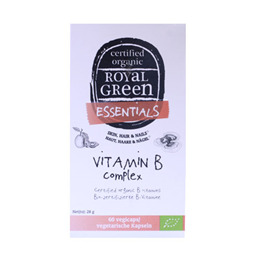 Royal Green delivers 100% certified organic B vitamins. Vitamins B1, B3, B6 and folic acid support memory, concentration and our state of mind.